William Caslon was an 18th century type designer. The William Caslon Experience is an accomplished musical duo who create unique, lush electronic downtempo landscapes. The William Caslon Experience have released 4 full length CDs and have had tracks remixed by DJ luminaries: The Herbaliser & Fila Brazillia. 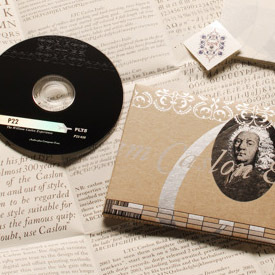 The P22 record label has teamed up with FLT5 records to compile some of our favorite tracks of The William Caslon Experience onto a new CD. This CD contains a brand new remix by Odiorne in addition to a brand new "remixed" Caslon font. The exclusive font can ONLY be purchased by getting this CD. The special CD "discfolio" packaging has been hand printed in three colors by letterpress designer Bruce Licher of Independent Project Press. Each CD is numbered and comes with a fold out broadside liner notes sheet/ poster. "some kind of cross between Medeski, Martin and Wood, Stereolab and Tortoise."